Cost: Average spend per person is £35 (not including drinks). Bellanger has a comprehensive all-day a la carte menu including Tarte Flamblées (£4.95 - £8.85), Oysters (£12.75 - £16.50 for a half-dozen), Salads and Sandwiches (£5.50 - £11.50), “Les Pots” or Hot Stews (£14 - £18 for one person) Fish and Meats (£12.50 - £24.75), and Desserts (£4.75 - £7.75). 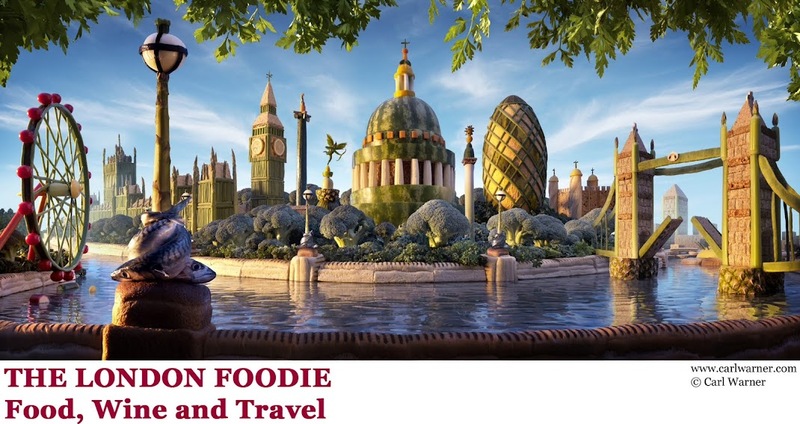 The restaurant also has a breakfast menu while brunch is served on Saturdays and Sundays. About: Bellanger is the latest addition to restaurateurs Corbin & King portfolio of popular London eateries, many of these inspired by the grand Parisian brasseries of the early 20th century. The Wolseley and The Delaunay, at the higher end within the group, are established institutions in London, while Colbert in Chelsea, The Colony Grill at the Beaumond Hotel, and Fischer's in Marylebone attract a faithful following that includes among its regulars various London chefs and food critics. At the other end of the scale, Brasserie Zédel offers classic French cuisine as an affordable experience. The newcomer Bellanger, whose name is inspired (as in the other Corbin and King restaurants) by a piece of automotive history - the Société des Automobiles Bellanger Frères which manufactured French cars from 1912 to 1925 - brings to Islington a menu with all the old French classics but with a focus on hearty Alsatian cuisine. The interior was designed by Shayne Brady, who previously created several of Bellanger’s sister restaurants under David Collins. The spacious restaurant is divided into a buzzy and more luminous front area with a gorgeous bar, perfect for solo diners; while quieter, cosier booths, small tables and larger group areas can be found towards the back. The Parisian cafe ambience is brought to life with use of glossy dark woods, antiqued mirrors, brass fittings and a fine attention to detail, such as the typical Alsatian green stemmed wine goblets on every table. 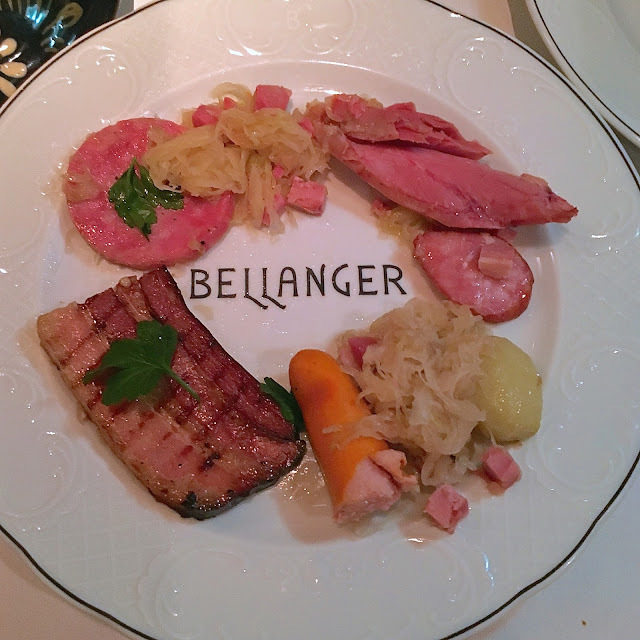 What We Ate: We decided to focus on the typically Alsatian dishes for which Bellanger is quickly gaining a reputation. For starters, we chose two of their Tarte Flambées - a crispy and paper-thin oval-shaped baked pastry, smeared with a faint layer of crème fraîche and finished with a choice of toppings. 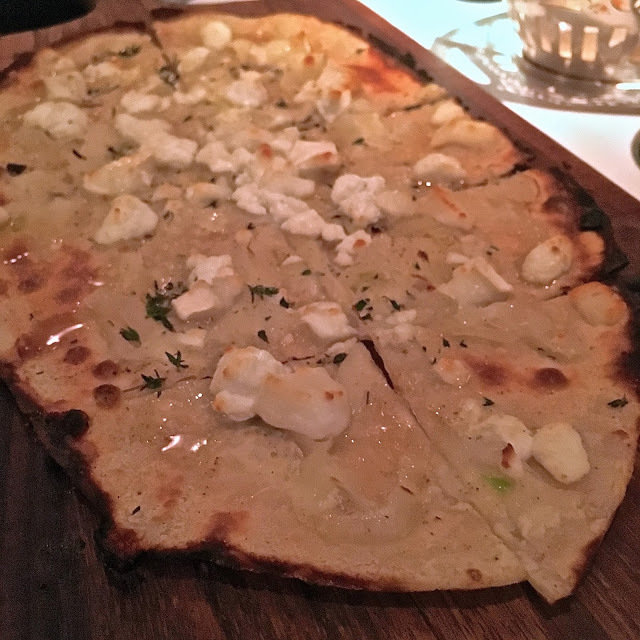 Larger than we had expected, our first Tarte Flambée was goat’s cheese, honey and thyme (£5.50), a deliciously light and satisfying combination that due to its thin nature was promptly consumed. As our second Tarte Flambée we chose champignons and fine herbs (£7.00): a fine example of buttery and fragrant chanterelles and girolles mixed with fresh herbs, at the same time light and fresh but containing a mouth-watering depth of flavour. Even those who do not particularly like mushrooms should give this a try, no other nation can cook mushrooms like the French! Moving on to the main course, I could not resist the Choucroute a l’Alsacienne (£16.00). 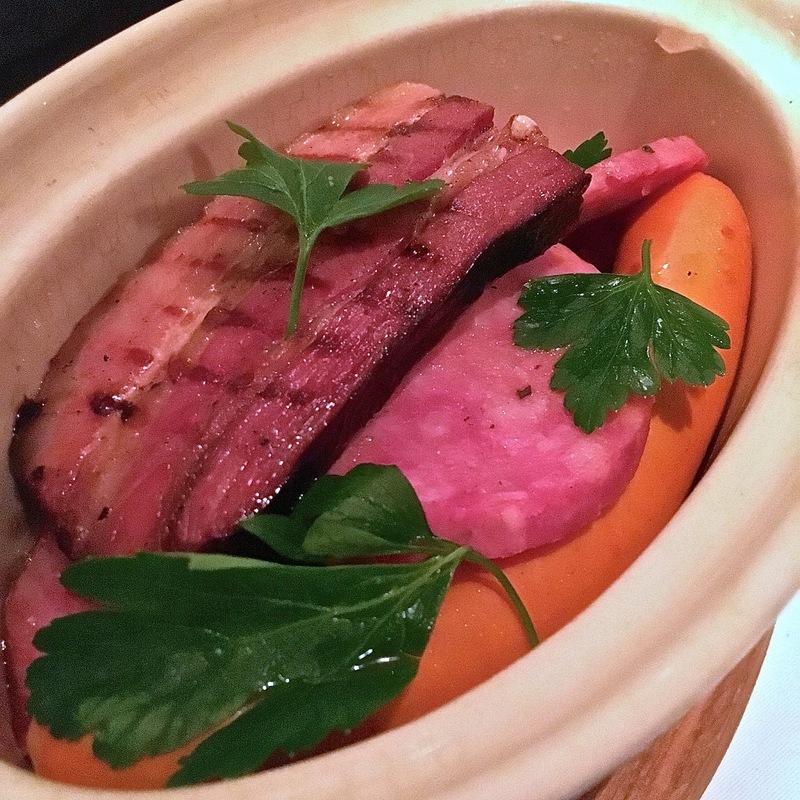 Brought to the table in a richly decorated ceramic pot, the lid was lifted to reveal an authentic porky feast: a mix of flavourful frankfurter, two choices of garlic sausages with meltingly tender pork belly and ham hock that fell apart into soft chunks at the touch of the fork, all sitting on top of sauerkraut which had a good balance of sharpness and saltiness. Altogether, the dish was very well accomplished and perfect on a very cold winter evening. A second identical ceramic pot also reached our table but this time containing Coq au Riesling (£14.00). Tender pieces of chicken mixed with more mushrooms, fresh herbs, Riesling wine and cream created a delightful and much more enjoyable white version to Coq au Vin. 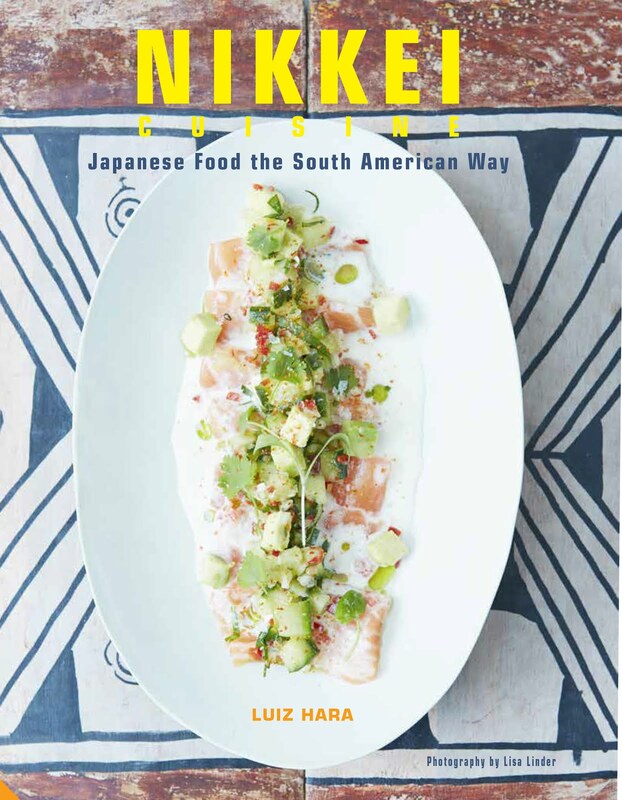 A recipe I would certainly like to recreate at home. By now we were already feeling quite full but could not finish the meal without giving some of the desserts a try. 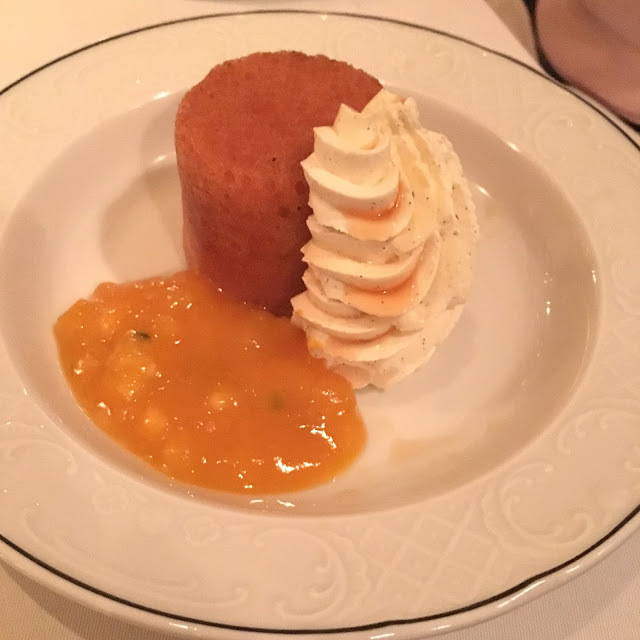 We started with a feather-light textured Baba cake, served with passion fruit purée and whipped cream (£7.00). The Baba was then soaked with a generous dose of rum at the table. The mix of textures and flavours worked really well but I thought it was a little too heavy on the alcohol. 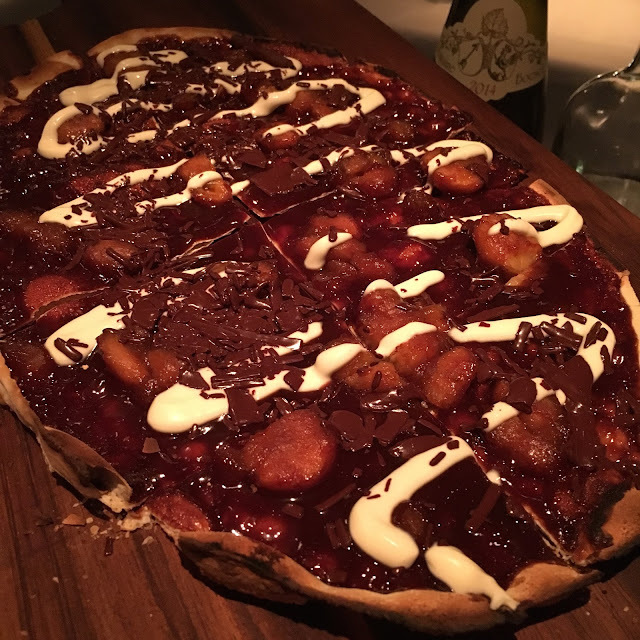 Our second dessert was the Caramelised Banana with Melted Chocolate Tarte Flambée (£4.75). It too proved to be a highly indulgent choice with bananas that were perfectly caramelised but maintained a pleasantly firm texture, on top of which milk chocolate was melted with abandonment with a further flourish of double cream. What We Drank: Bellanger has an extensive wine list which includes a good range of choices by the glass (£6.75 - £14.75), a few half bottles (£24.00-£59.00) and full bottles from £22.50 to £295.00. Sticking to the Alsace region, and after tasting a couple of different options, we settled on a bottle of Pinot Blanc, La Cabane, 2014, Domaine Leon Boesch (£41.00). A biodynamic wine created from 70% Pinox Auxerrois and 30% Pinot Blanc, it sported a zesty, clear cut, with notes of lemon and spice which stood up well to the meaty Choucroute and the flavourful buttery character of our meal. Likes: The Tarte Flambées were some good I found them almost addictive. The thought of returning to Bellanger to try out the other flavours is indeed very tempting. Altogether the menu is competently executed with reasonably priced dishes. The stylish retro decor is warm and welcoming. Dislikes: On a week night with the restaurant a third full, we were given the worst possible table at the back of the restaurant in a totally empty room, I just wonder why? They promptly moved us to another table as I requested. The wine list has been expertly put together but few bottles come below the £35 tag. 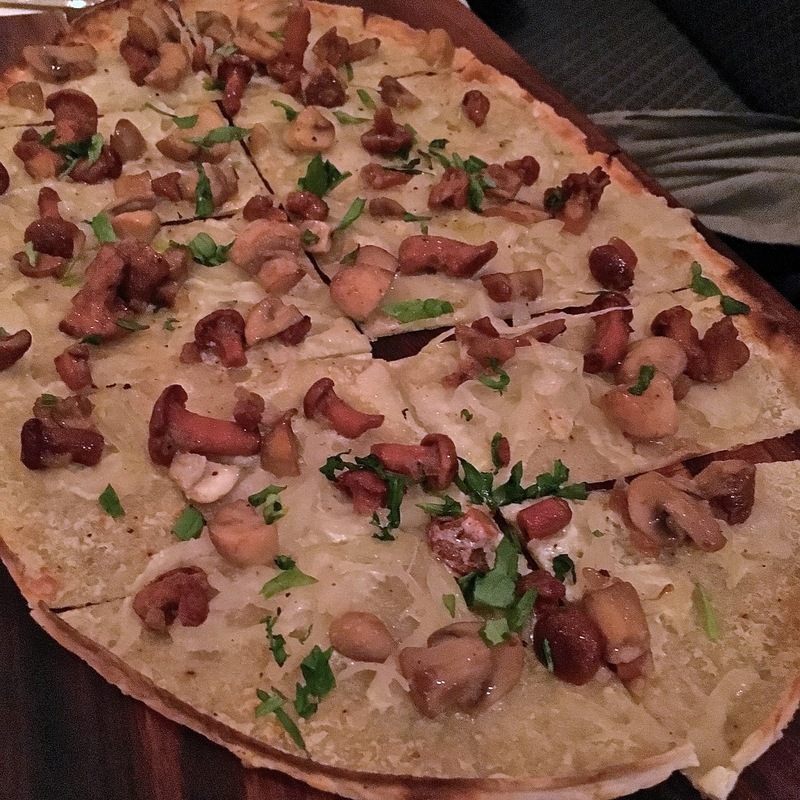 Verdict: Bellanger with its Tarte Flambées is a good addition to the Islington restaurant scene, with a restaurant that brings affordable high-quality French cooking that can appeal equally to solo diners, couples or family meals. Recommended.